The first lesson of “Derivatives & Options” tutorial focuses on difference between Forward and Futures with an introduction on pricing of those contracts. It is important to understand these concepts before to read my personal research concerning Derivatives & Options and Characteristics of EBS Market. Non-Standardized contract between two investors that agree to buy (sell) a determined product at some point in time in the future. It is often referred as “over-the-counter” because there is usually no formal platform to trade Forward contract. One of the advantage is the possibility to personalize the contract (not standardized). One of the disadvantage is credit risks (risk that the counterpart does not respect his promise) that face the investor. Standardized contract between two investors that agree to buy (sell) a determined product at some point in time in the future. These products are traded on an official exchange (CME, Euronext, etc.). One of the advantage is the virtually nonexistence of credit risks because it is assumed by the exchange. One of the disadvantage is that product’s characteristics cannot be change (standardized). In the above formula, F represents the value of the futures/forward today, S the value of the spot, r the risk-free interest rate, q the asset income and T the time left before expiration of the contract. It is important to understand the value of a contract depends directly on the spot currency which is traded in either EBS/ICAP or Reuters market. In many ways, futures and forward contract are almost perfectly correlated with his underlying (spot). For many readers, q variable might be unclear. There are products that offer benefits/costs for holding the spot instead of having a contract that promise a certain product in the future. For example, many investors would like to hold real gold (spot) instead of getting an intangible contract to buy/sell it in few months; it is a benefit for the investor. In another hand, investors holding gold must rent a safe box into a bank or any other way to protect it; it is a cost for the investor. A situation where r > q is called Contango. The opposite situation, r < q, is called Backwardation. 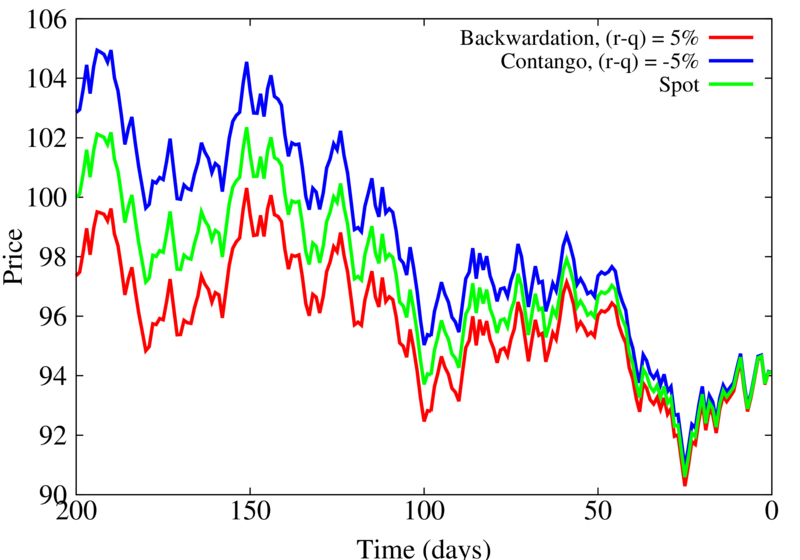 Readers can consult the graphic above where the spot currency (green) is between the Contango contract (blue) and Backwardation contract (red). The difference in price between a contract and his underlying gets smaller when we are close from expiration. Motivated readers can consult files used for generating the previous graphic (shell language and gnuplot). Obviously, text files contain all basic information and readers can use their own software (Matlab, R or Excel).